Jan 16th, 2019 05:03 PM Отличный проект,жаль что сразу недооценил его.Взял классный профит и думаю хватит.Всем удачи! Dec 2nd, 2018 08:57 AM 1paycoin.com is a SCAM, the general public should take proper note. Aug 29th, 2018 04:29 PM It does not pay since June 30. Account is locked without explanation. The administrator does not respond to requests. On IPS - in the status of PROBLEM! Nov 15th, 2017 01:17 PM My payment received were delivered fast and as promised! $270.00 has been successfully sent to your Perfectmoney account U........ Transaction batch is 197707485. Oct 26th, 2017 02:12 AM The amount of 18267.85 USD has been deposited to your Perfect Money account. Accounts: U14972070 ->U*****. Memo: API Payment. 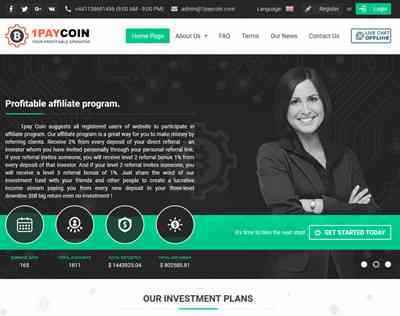 Withdraw to from 1paycoin.com. Date: 01:36 10.25.17. Batch: 126925611.